Additive manufacturing is an inherent part of industrial manufacturing. 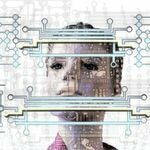 In the fields of prototyping, fabricating individual parts and complex geometries, or research and development can be found various procedures like 3D printing technologies, which enrich those fields. Due to the various technologies, additive manufacturing is on the way to be utilized in the medicine sector. Besides special designed medical tools, prostheses and implants are the most desired products for medical 3D printing. Craniofacial surgery takes a prominent place in this context. Individual implants take a decisive role in those fields. In dental applications, custom-made tooth replacements are one of the possibilities given by 3D printing technologies. The choice of the materials to be used for the implants is crucial and comes hand in hand with the technology that should be selected. One of the materials that is known for its use for implants and in dental technology, is the high-performance polymer poly ether ether ketone (PEEK). A polymer that qualifies as a material for medical applications due to its chemical stability, biocompatibility and tolerance towards radiation, as well as through outstanding wear resistance because of its mechanical properties, PEEK has a tear resistance of 98 MPa. In addition comes a very low specific weight of 1,30 g/cm³. In dental context, PEEK benefits from low plaque attachment, a desired property for materials for tooth replacement. A 3D printing technology, which meets the requirements of individual parts and processes the high-performance polymer PEEK with zero material waste, can be found with the Fused Filament Fabrication (FFF). During manufacturing the material as a filament, a kind of polymer strand, will be melted through the printhead by up to 500 °C and laid down in different layers to build up the part. Controlling the solidification process of the semi crystalline polymer is crucial for a good product quality. 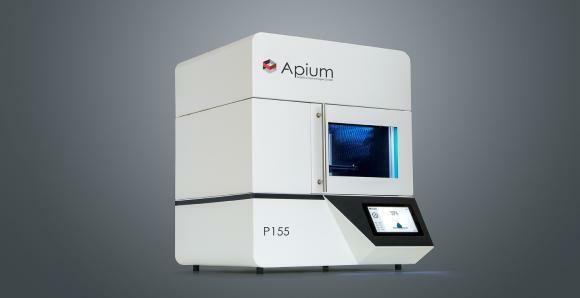 A printer that meets the prerequisites is the Apium P155, developed by Apium Additive Technologies GmbH. Till now the printer is only designed for industrial applications. Apium Additive Technologies GmbH has started a cooperation with the Center for Dental and Craniofacial Sciences of Charité Berlin, directed by Prof. (UH) Dr. W.-D. Müller. Goal of this cooperation is a study to determine the printing performance with PEEK compounds in dental applications. The high-performance polymer 3D printer Apium P155 with its Fused Filament Fabrication technology delivers the hardware for this 3D printing study. In a first step the 3D printer is used to fabricate different structures to test their tensile strength in comparison to extruded samples. In the next step, after satisfying results are achieved, single crown frameworks will be manufactured and compared regarding their quality. Crucial properties are the dimension precision and liability. 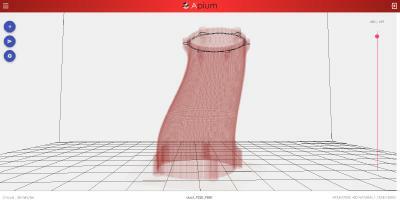 The scale is set by CAD CAM milled structures. The Center for Dental and Craniofacial Sciences will receive assistance by Apium’s 3D printing engineers at the beginning to understand the 3D printing technology and run first sample prints. The outcome of this is the first step to develop a 3D printer for dental applications. 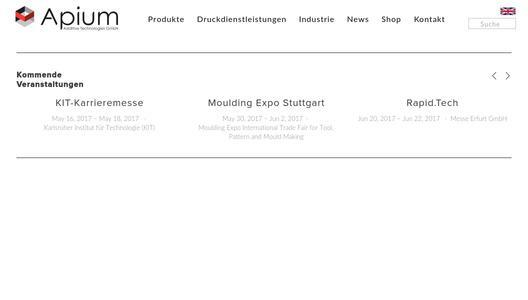 Besides this cooperation, Apium Additive Technologies GmbH intentions are to develop filaments for the use in medical applications as implant material. For this, Apium cooperates with Evonik Industries AG. With testing the possibilities of Evonik‘s high-performance polymer VESTAKEEP® PEEK – a biomaterial for medical applications – the goal is to find out how this material can be processed with FFF technology to be used as a material for 3D printed implants. The different VESTAKEEP® classes will be examined and possibly modified to achieve the desired results. With both cooperation, Apium Additive Technologies GmbH is on the way to become the leader for FFF based medical 3D printing and will to revolutionize the way of manufacturing accurate and individual implants.